I was so excited to open a box sent for product review and find a WearEver Pure Living Nonstick Ceramic Coating Saute Pan/Fry Pan! This pan is super nice, super safe, and super easy to clean. It’s even dishwasher safe! Pure Living is a revolution in nonstick cookware. The cookware is scratch and stain resistant with an interior and exterior surface that are easy to clean (it is dishwasher safe). It features a nonstick ceramic coating that is metal utensil safe and is PTFE, PFOA, Cadmium and lead free. The aluminum base guarantees high heat retention making it excellent for searing meats, poultry, and fish and it delivering crisper, more evenly cooked food. The cookware is safe for all cooking surfaces (except induction). All the pieces have silicone riveted handles for comfort and more durability, glass lids and nonstick exteriors. One of my early blog posts was about non-stick cookware and my search for safe muffin pans. Non-stick cookware gives off a gas that can be fatal to pet birds, thus I have likened it to the canary in the cave for human use of nonstick cookware. PTFE, PFOA, Cadmium and lead are common, toxic ingredients in non-stick cookware. When non-stick cookware was first introduced in the 1950s, the convenience of cleaning pots and pans after cooking was revolutionary. Unfortunately, the chemicals used to create this slippery surface are toxic to humans. In fact, 99% of Americans’ bodies are contaminated with toxic PFOA. You don’t have to give up the convenience of non-stick or compromise your health. 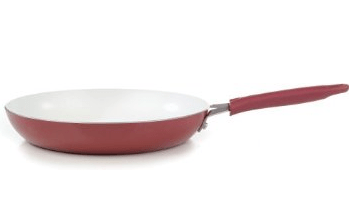 There are options like the WearEver Pure Living Nonstick Ceramic Coating Saute Pan/Fry Pan. I really like this frying pan! Usually I shy away from aluminum cookware, but since it is sealed off from food by the ceramic coating, I feel it is safe. Furthermore, this product is very affordable!